It’s time for your porch to get a fall-ready makeover that can carry you straight through to Thanksgiving. Fall decorating is an eye-catching and a simple way to add plenty of curb appeal to your home. 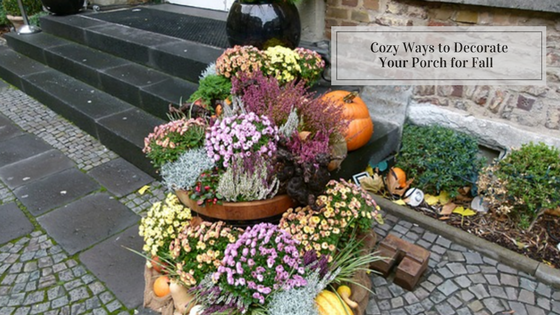 Choose from any of these ideas to welcome the fall season to your front porch. Create a defined color palette with a single color for a modern, contemporary trend. Shades of white and gold add a touch of sophistication. Spray painting pumpkins and gourds to place on porch rails or steps is a fast way to add pops of color. Remember teal pumpkins are showing up on porches during Halloween season to signal that the family inside is giving out non-food treats which are safe for people with food allergies. Choose unexpected porch and door decorations. Your front door is prime real estate and a focal center point for your home. Consider decorating the door with a basket of faux apples instead of a floral wreath. Use a half basket or a bushel basket lid to mount some faux apples in shades of red or yellow. Fill a tin container with faux gourds and mini pumpkins to hang on the door. If you have a wooden ladder use this as a plant stand to line chrysanthemums or seasonal blooms up the rungs. Hanging a cozy blanket over each rung is another way to bring unexpected color to your porchscape. Reclaimed wood or shipping pallets repurpose well for a painted sign. Whether you choose a vertical or horizontal sign, it’s up to you. Spell out any of these words to bring fall to your front door: Fall, Autumn, Pumpkins, Trick-or-Treat, Harvest. For Halloween signs consider spelling: Halloween, Boo, Ghosts, Scary, Broomsticks, or Be Witched. A signed propped beside the door will greet your guests and bring a smile to a passerby. Get creative with displaying pumpkins and gourds. Lining pumpkins and gourds on the steps extends the decorations from sidewalk to front door. Turn pumpkins into house numbers by stacking the pumpkins in a flower planter to make a topiary with a number painted on each one. Instead of carving a traditional cut-out into a pumpkin and adding a candle try using a marque letter. Press the marque letter into each pumpkin and flip the switch on the letter to add some trendy twinkle. Make use of burlap and fabric strips as ribbon. Tie a strip of burlap into a bow around a pumpkin or gourd. Frayed strips of fabric ribbon tied to porch posts or railings bring color to plain post. Add a fabric ribbon around the handle of a basket. These simple accents make big statements. Add whimsy to your front glass door. Attach faux leaves to your glass door with a hot glue gun. The hot glue can be peeled off when the season has passed and you’re ready to change the décor. Create a pattern with the leaves. The leaves could form a swirl as if blowing in the wind or have more towards the top and fewer as they cascade down the door. Let your creativity lead you. Any of these ways will add a touch of cozy to your porch. If you’re considering buying or selling a home in the Twin Cities area, please think of Tom Schooley at RE/MAX Alliance Realty first! Otherwise, do you find these tips helpful? What other porch decorating tips have you learned? If you like this info, please share with your friends.